We combined our cool Mimi Green style with your dog’s need for comfort, safety, and easy living and we got our new step-in Designer Dog Harnesses! We make harnesses tiny enough to accommodate dogs as small as puppies, and ones large enough for the lovable giants. 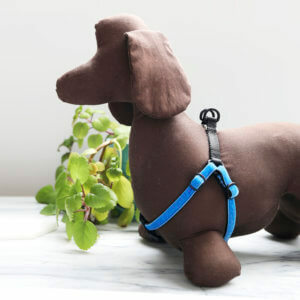 Each harness we make at Mimi Green is made to order for your special dog. Tough nylon webbing in 26 rich colors! This is the reliable stand-by… also great for your active dog. Luxurious Swiss velvet is washable, dirt resistant, strong and long lasting and comes in over 15 colors. Make a statement! Our classic collection has endless patterns in cotton, linen, canvas, voile and more. Shiny, stain & dirt resistant, resists water, brightly colored, super easy to clean, and dang cool designs. A must for night walks… the 3M reflective tape looks gray in the day, but is brilliantly reflective at night. All your dog has to do is step in their front legs, you pull up and snap, and you two are ready to go. Couldn’t be easier or better looking! Every harness is made of washable designer fabrics so you can keep your pup’s specialty dog collar in pristine condition. It’s built to last! We utilize large gauge D-Rings and tough nylon webbing that can withstand over 3,100 lbs of pressure, so you can rest assured your pooch is secure. Choose your favorite buckle: Plastic, Hybrid Metal/Plastic, Silver, or Brass. It’s made with contoured buckles that fit the curves of your dog’s neck for ultimate comfort. Add engraved buckle, name plate, or hand embroidery. Laser engraved text is guaranteed to last! All your dog’s info will be right on the harness. Genius! I sized up so if my pup keeps growing it can grow with him. The color is BEAUTIFUL! We get complimented on it all the time. I loved it so much that I ordered one for my sister’s dog! 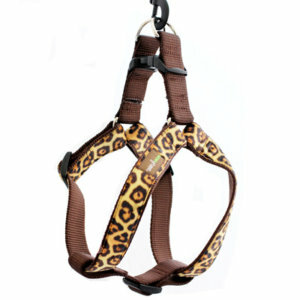 Leopard Velvet Dog Harness — 8 colors!